The future of funny, Franco Nguyen, dives into his not-so-funny past. Fresh off his featured performance at the NBC Breakout Comedy Festival in Chicago, this award-winning comedian shares his stories about going to Vietnam for the first time in 25 years, meeting his previously non-existent 8 year-old step-brother and being re-introduced to the parents he thought he knew. Part stand up and part theatre, Nguyen’s unique and hilarious perspective will be showcased in this one-person show debuting at the 2017 Toronto Fringe Festival. 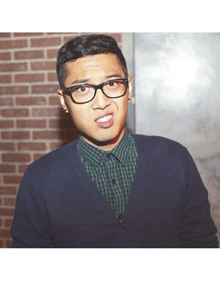 Vietnamese-Canadian, Franco Nguyen is a rising comedic star. His ascent though the comedy ranks started when he was featured in the Second City Tim Sims Cream of Comedy. He won the producers pick at the 2017 Toronto SketchFest and the Best Newcomer Award at the 2017 Montreal SketchFest with his sketch troupe TALLBOYZ II MEN. Franco is a recent alumnus of The Second City’s Bob Curry Fellowship and is a familiar face at stand-up clubs and comedy venues across Toronto. He lives with his mom.